Who would have thought that a visit to the Bates Motel could be rewarding? 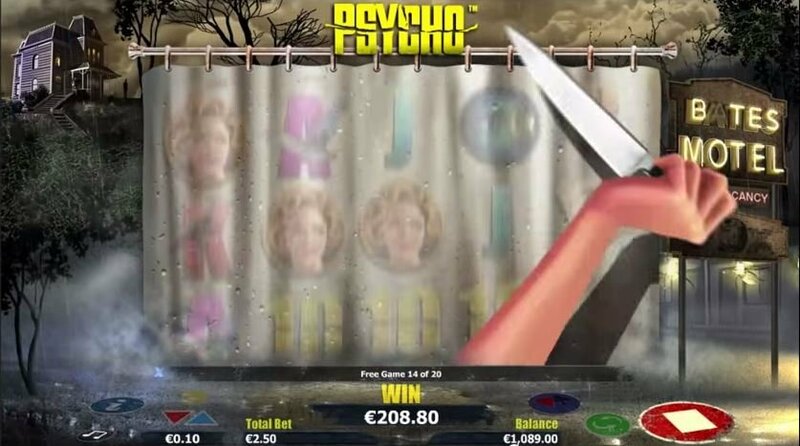 In the deliciously frightening Psycho slot, you’ll not only be impressed with the graphics and the overall design of this game that is based on the popular Hitchcock movie, but you’ll also like the bonus features that could result in multipliers up to 40x! Powered by NextGen Gaming, the Psycho slot machine is based on Alfred Hitchcock’s famous 1960’s mystery thriller-horror film. Produced in partnership with Universal Studios, this 25-payline and 5-reel online slot from NextGen promises more than suspenseful thrills! 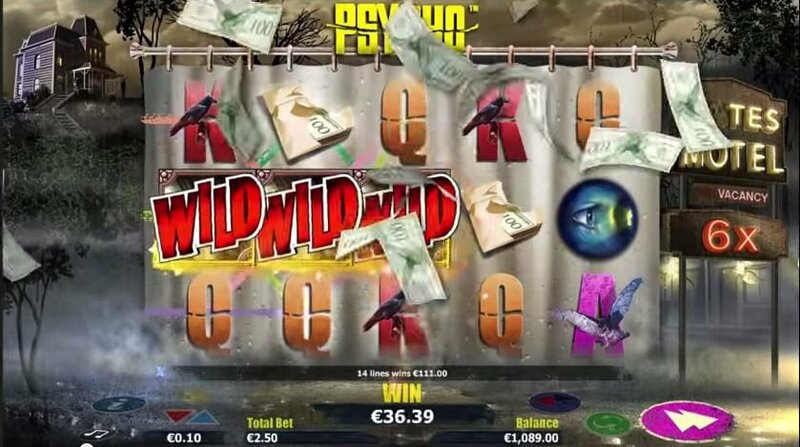 It’s also teaming with outstanding graphics, a chilling soundtrack, and great bonuses, which you will discover in this Psycho slot review! The game has been impressively designed to mirror the feel of the suspenseful film. The reels are laid out on a wet shower curtain that continuously drips water. Behind the reels is an eerie nighttime scene featuring the infamous Bates Motel, the sign for which is lit up and flickers on occasion. The haunted house at the top of the hill can also be seen in the distance, while mist moves about the ground, and every so often thunder claps and lighting strikes. The reels feature the classic 10, J, Q, K, A low-value symbols, as well as iconic images from the movie. Some of these include: a room key, an envelope of cash, the wooden house, the main female character, and the private detective. If the scary soundtrack doesn’t unnerve you, other elements of the Psycho game like the hand that suddenly appears and hacks at the reels with a knife, or the famous show scene, are sure to put you on edge. The thrills will definitely keep you on the edge of your seat. There are two main Psycho slot bonuses. The first are Psycho Wilds, which are wilds that can be added to any spin in the base game. If a wild leads to a win, it can be multiplied by 2x, 3x, 4x, 5x, 10x, or, if you’re really lucky, 20x. These multipliers are applied completely at random. 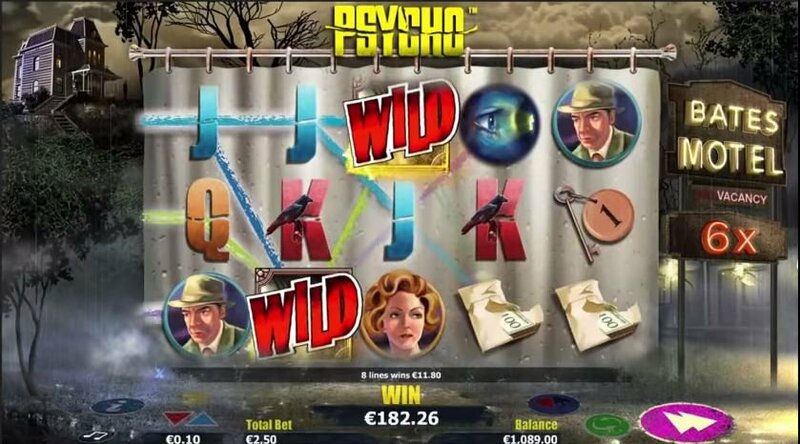 The Psycho slot also has a Free Game feature. This feature is activated when you land 3 or more Haunted House scatter symbols anywhere on the reels. 3 scatters will award 10 free spins, 4 will award 15, and 5 will award 20. During this feature, wilds will appear and wins including wilds may be multiplied several times up to a whopping 40x. In addition, this feature can be retriggered if you manage to land 3 or more scatter symbols while the feature is still active.